Markeisha is a sweet and energetic youth who likes to be sociable and surrounded by people. She currently enjoys going to yoga, watching movies, and playing in weekly sporting events. Markeisha learns at a slower rate than other children her age. Although she enjoys activities in groups, she thrives in environments that are structured and have continued supervision. Markeisha does not let anything slow her down or isolate her in anyway. She can often be found passing time by going to church or playing on her electronic hand-held games. 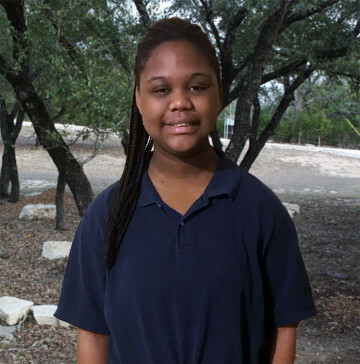 Markeisha will be a great addition to a family that likes to do things together and who is active in the community. Markeisha will benefit from a family who is nurturing, but who also sets appropriate boundaries. She will need a family who is very patient and can redirect her behaviors when needed. Markeisha requires constant supervision and may do better if she is the only child in the home in order to get the attention she needs. She benefits from consistent consequences for her actions, so it is important that the family be able to provide her with this. Her de-escalation techniques are talking her issues out, writing in her journal, and drawing, so it's important that the family be supportive of these techniques.